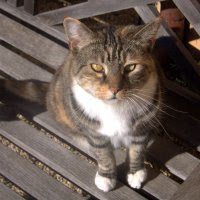 This visitor to the garden stopped just barely long enough so that I could take its picture. The larvae of the California Tortoiseshell butterfly feed on Ceanothus. 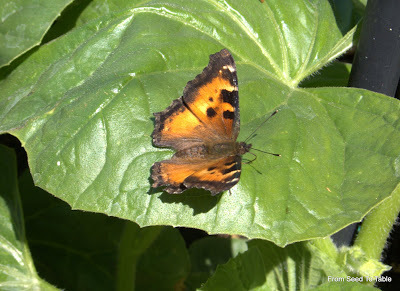 The adult butterflies feed on nectar. 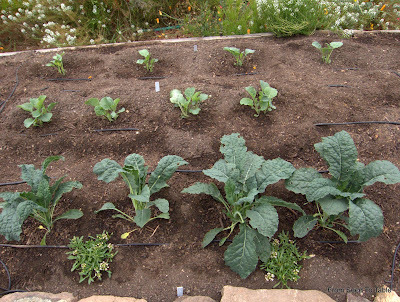 It's been almost two weeks since I last posted about the vegetable garden. My, how things have grown! I really like going back and looking at pictures of the garden in different stages of growth so please bear with me when I offer up these photo laden posts. 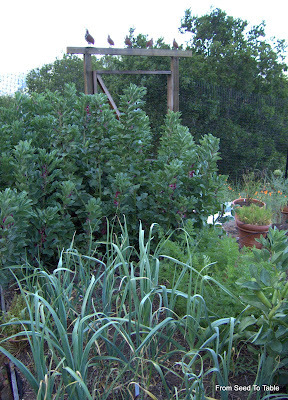 The photo above shows the Green Beauty and Magnolia Blossom peas starting to reach past the tops of their trellises. The beans and golden beets have about doubled in size. 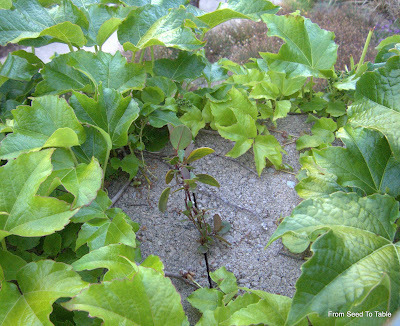 The Dewings beets are poking along and becoming hidden by the bean foliage. The serpent cucumbers are starting to take off at the base of the column. 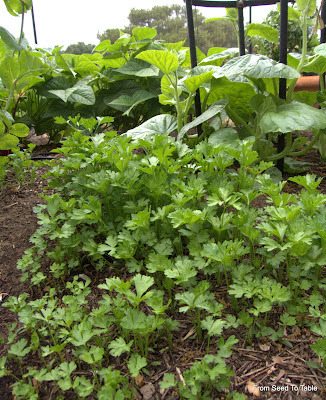 And the parsley patch shown below needs to be thinned. 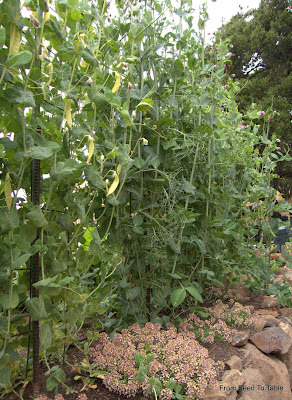 Above is the pea patch shown from behind. Sweet alyssum "Summer Peaches" are spreading out at the feet of the peas. The bees and other beneficial insects love sweet alyssum. The Magnolia Blossom snap pea is developing a bit of a purple stripe. Not all the pods have that. 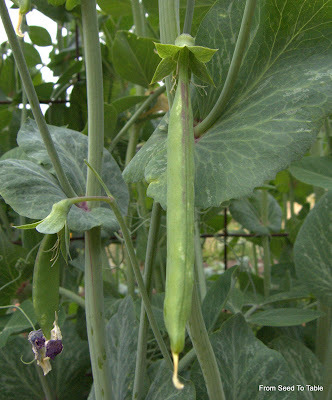 Here's a Green Beauty snow pea. It's about 5 inches long, not quite the 7 to 8 inches described in the yearbook, but still impressive and tasty as well. Perhaps they reach 7 to 8 inches if allowed to fully mature. 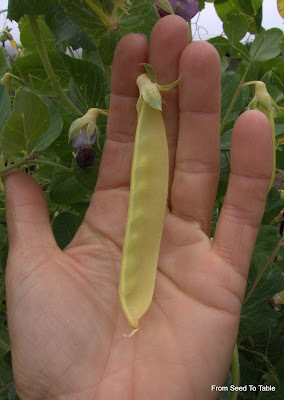 This is the Golden Sweet snow pea - a bit smaller. The vines of this plant are shorter as well. A golden beet growing between the peas and beans. Growing like crazy and starting to become a tasty treat for leaf miners. Cilantro is growing behind the beets. I didn't think the beets would get so big so quickly. 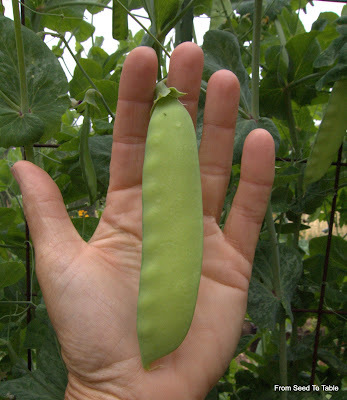 An itsy bitsy teeny weeny Landreth Stringless bean! Tuscan arugula in full bloom. I liked the flavor of this arugula so I want to save some seeds. The flowers are pretty as you can see below. 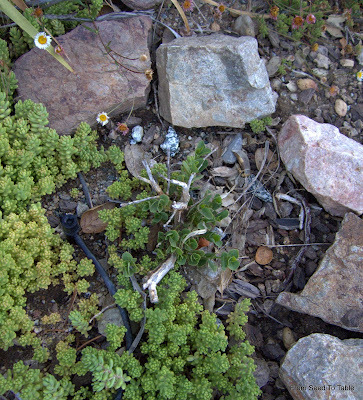 These cross-shaped flowers demonstrate why this family of plants was named "cruciferous". 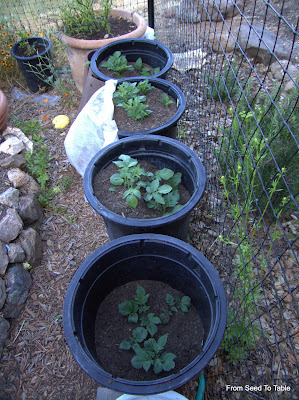 Most of the potato pots have been filled with soil. Above are shown "Purple Rose" (top) and "Red Thumb". Below are, from top to bottom, "Negresse", "Lumper", "Ambra", and "Cherries Jubilee". I chose heirloom and rare potato varieties. Why grow potatoes that I can get at the farmer's market? 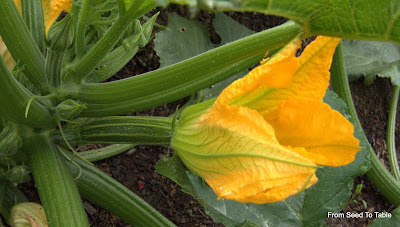 The "Cocozelle" zucchini has grown huge already and has started to bloom. The "Gigante" kohlrabi is happy also. "Golden Chard" is poking along. The peppers are growing, not quickly, but they are doing ok. I took out the "Superaguadulce" favas and have started to put in eggplant. There's a couple of "Thai Round Green Petch Parisa" and a "Lao Purple Stripe" planted. I've got some "Diamond" plants hardening off before I put them out. 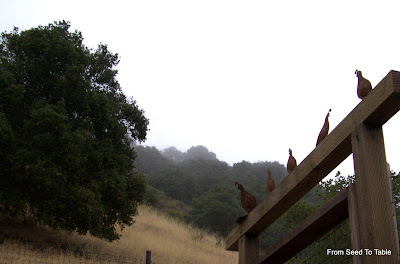 Typical morning and evening weather for this time of year - fog. It usually burns off in the valley by mid-morning. The cool nights (and sometimes days) make for slow growing peppers, eggplant, and tomatoes which is why my tomatoes are only as far along as shown below. Above, the Cavolo Nero kale is growing nicely - they need a final thinning. 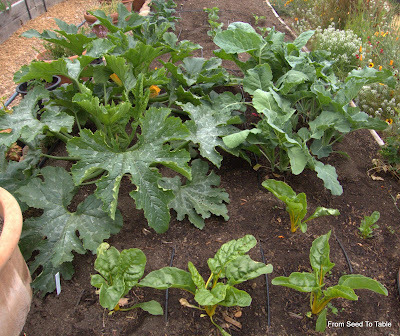 In the middle of the bed is a Portuguese kale originally from the Azores. 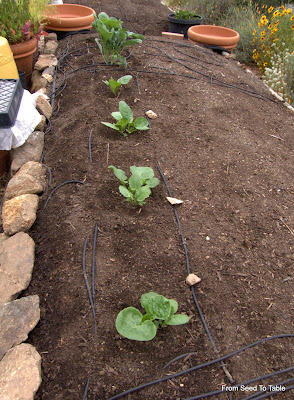 On the far side of the bed are newly planted "Piracicaba" broccoli plants. 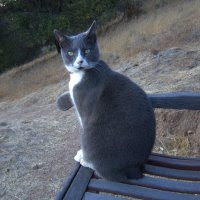 What fun, plants with their origins in Tuscany, the Azores, and Brazil. 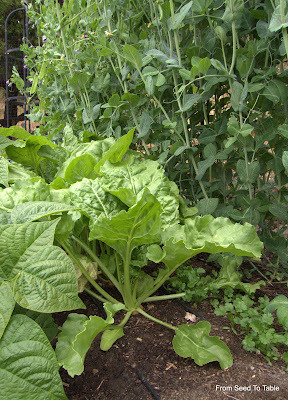 And nearby, plants from Japan - Senposai (a cross of Komatsuna and cabbage) shown below. And another representative from Italy beyond - di Jesi cauliflower. The remnants of the winter garden are shown above. Garlic, carrots and Crimson Flowered favas. 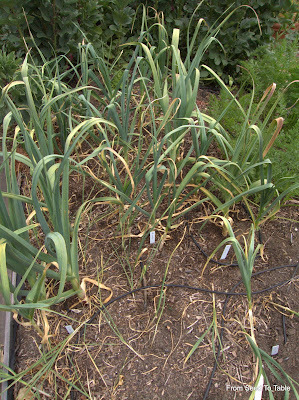 I'm not concerned about this patch of garlic maturing to full size, they are intended for picking "green". I've pulled all the "Cosmic Purple" carrots since they had decent sized roots and had a tendency to bolt. There's a few "Atomic Red" left - a number of them bolted as well. 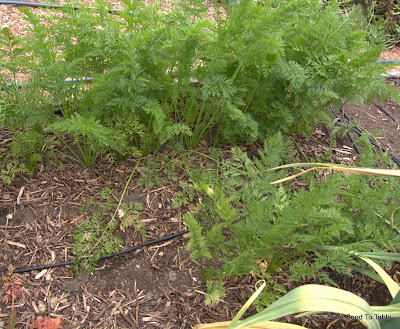 The "Lunar White" carrots have been slow to size up and the "Amarillo Yellow" are only a little bigger. 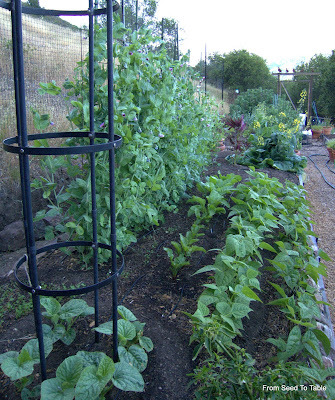 I need to pull the carrots and garlic in a few weeks so that I can plant some edamame there. 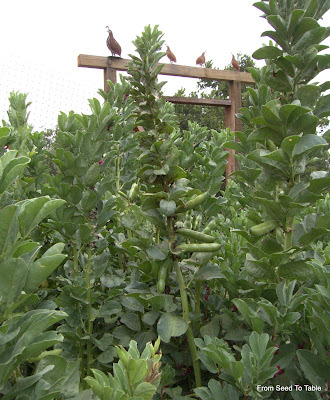 The Crimson Flowered favas finally have beans to harvest! The Caper on the left has been brined for one day at room temperature and then six days in the refrigerator. The one on the right was picked this morning. The white spots on the brined caper are rutin crystals which form as mustard oil (glucocapparin) is released from the bud during the curing process. 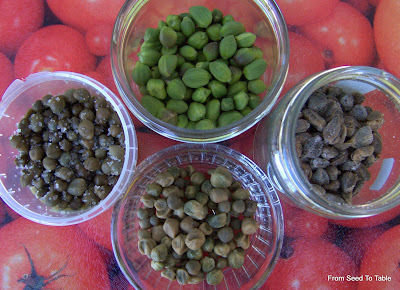 The mustard oil and rutin are important parts of the characteristic flavor of capers. 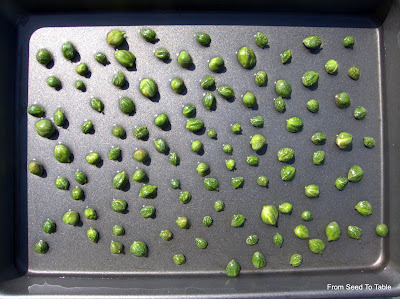 Here's the ounce of capers from last week spread out on a baking sheet with the brine to dry in the sun. 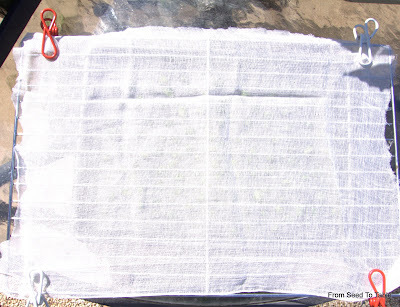 I've also rigged up a cover of a single layer of cheese cloth to cover the pan to keep out bugs and other debris. I've read about three different ways of curing capers. One is brining, which is what I'm experimenting with. If the capers are left in the brine solution at 60F to 72F for a month or more they will become pickled. Capers processed in this way can actually be left in the brine for up to a year without further processing. I don't want my capers to become pickled so I'm drying them after a week in brine. My second picking of buds (another ounce this morning) went into a fresh brine solution and straight into the refrigerator. 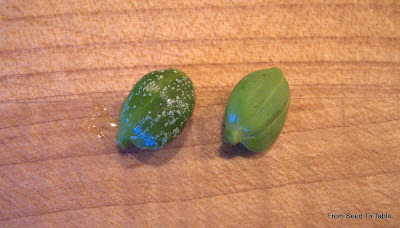 The second method I've read about is to mix the capers with coarse sea salt which draws the water from the buds to create a brine that cures the capers. The capers sit in the salt for 10 days, then are rinsed and mixed with fresh salt for a total of three 10 day treatments. After the final rinse the capers are packed in fresh sea salt. 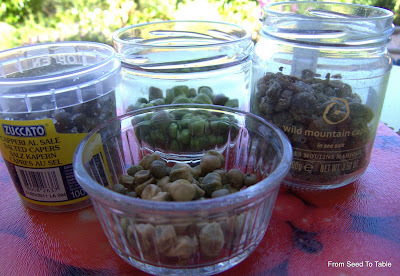 The other cure is to simply dry the caper buds in the sun until as hard as dried chickpeas - no salting is involved. 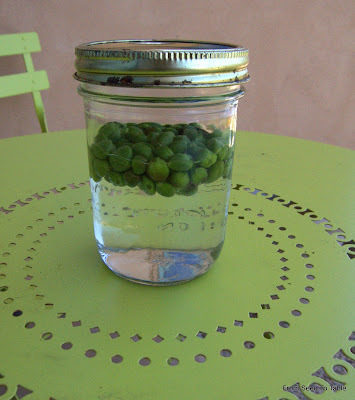 The dried capers must be soaked overnight in fresh water before using them. As I said in my previous post, I love the salted and dried capers from Tunisia, but I've not found any particulars about the process, so I'm experimenting. That was my haul yesterday morning! I foraged through all my plants and came up with just over an ounce of fresh buds of various sizes. According to the "authorities", the smallest buds are superior and the larger they get the less desirable they become. Hmm, I'm not sure why that should be other than that it takes a lot more time to pick a pound of tiny buds than it does to pick a pound of big buds, so that makes the smaller buds more expensive and we all know that the more expensive something is the better it is. Right? Hmmph. In the photo below, starting at the top and going around clockwise, my ounce of fresh buds, dried and salted wild capers from Tunisia, my experiment from last year with salting and drying capers, salt preserved capers from Italy. Note the absence of nonpareil capers packed in vinegar. I didn't have any of those on hand because they are my least favorite and I only use them when I can't get salted ones. The vinegar packed capers taste primarily of vinegar to me, cheap yucky vinegar. Salted capers taste like capers. And in my opinion, the biggest salted capers are the tastiest. I like those Tunisian ones straight from the jar, a chewy, salty, capery burst of flavor. Fantastic fried! They are, however, hideously expensive. 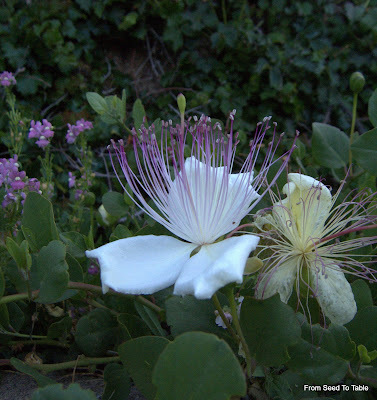 So, I'm on a quest to make something like those Tunisian Wild Mountain Capers. My Croatian plants produce big fat buds and that is what makes up the bulk of my first harvest this year. I've put them into a brine solution and will let them sit in that a few days, then I'm going to dry them. I experimented with that process last year. The buds are tasty, but sun drying them too long bleaches the color so I need to experiment with the drying process this year. Last year I had buds mainly from my Tuscan plants, smaller buds that I think will do better simply preserved in salt without the drying step. 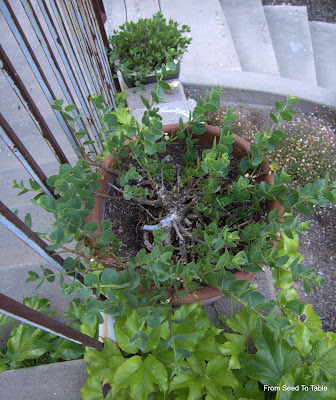 As I mentioned in my previous post, I've been experimenting with caper bushes for a few years. My best results so far have been with growing them in pots. 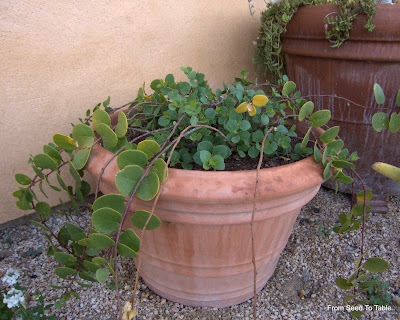 There's one of the best looking shown above growing in an 18-inch diameter terra cotta pot. 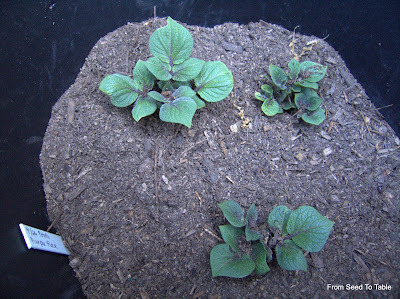 Below is a photo of my very first plants, purchased mail order from Richters Herbs at least 7 or 8 years ago. There are 2 plants in that pot. 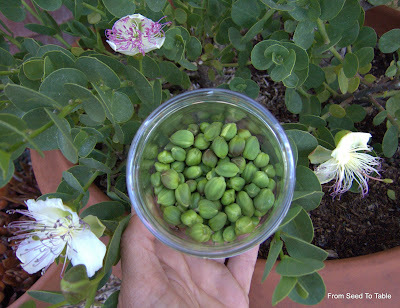 My first successful experiments at growing capers from seed were done with seeds from these plants. Since then I have grown plants from seeds from Tuscany and Croatia as well. The plant above wasn't trimmed back this winter so it is rather funky looking. 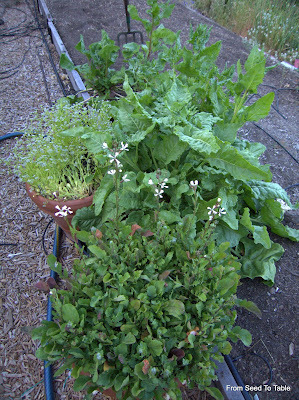 The next photos are of plants that I trimmed back and moved into larger (18-inch) pots this past winter. 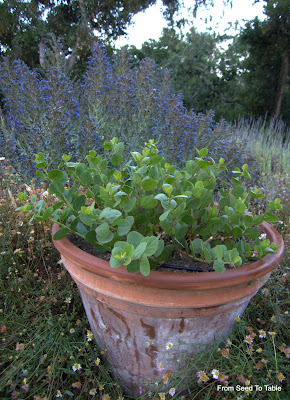 These are plants grown from the Tuscan seeds, as is the plant in the first photo. 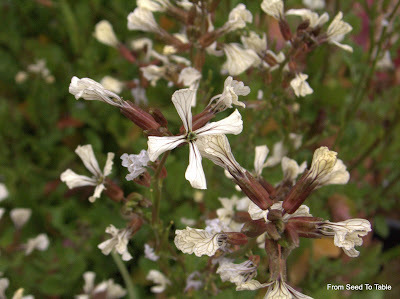 There is a fair amount of variation in the Tuscan source plants. 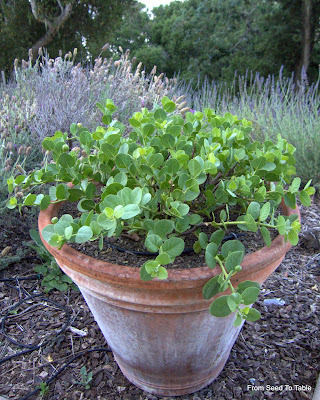 The next plant is one of my more successful attempts at growing capers in the ground. 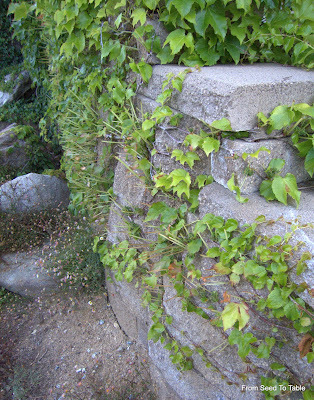 It is growing atop the wall that retains the slope below the house. The wall is south-southwest facing. 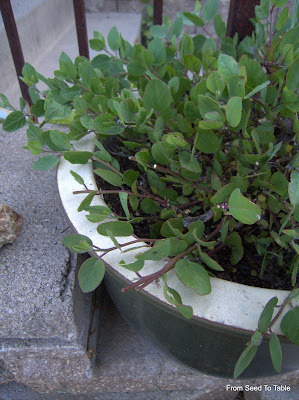 These bushes are a different strain of caper (Croatian), being more prostrate than the plants shown growing in the pots. Here's a newly opened flower. 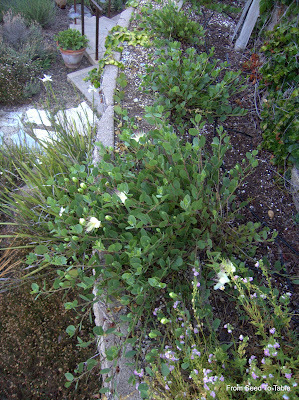 Caper blossoms open in the late afternoon or early evening and only last a day or two. They have a fragrance that reminds me of the scent used in Johnson's Baby Powder. Here's another shot of the plants atop the wall. These were planted 2 years ago from 4-inch pots. I hope that they will cascade down the wall someday. And over here is one of my less successful attempts at growing a bush in the ground. This one has been in this spot for almost 2 years, transplanted from a gallon pot. It has shrunk, but I haven't given up yet. 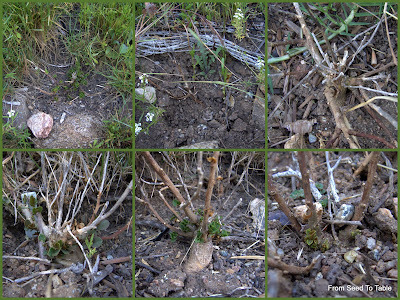 The collage shown below is of my most recent attempt at putting plants in the ground. These were planted on the slope below the vegetable garden last fall. What a mess, one is definitely dead, trampled by the foraging deer. Another one looks completely dead except for the hint of a shoot coming up from the crown. The rest were doing ok until they dried out in a heat wave last month but now they look like they may be coming back. Well, I'm not going to take them out, but I am going to plant rosemary on that slope too. May the strongest plants win! Here's a couple of plants in smaller pots that I did not get around to moving into larger pots this winter. It's interesting how they will grow to a size that the pot can accomodate and then stop. Capers don't really like having their roots disturbed so I prefer to transplant my most valuable plants (to me) when they are dormant. 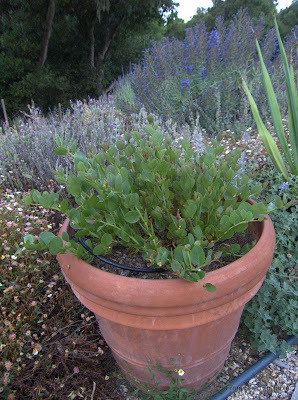 Although I have found that I can pot up from 4-inch or gallon pots at any time. 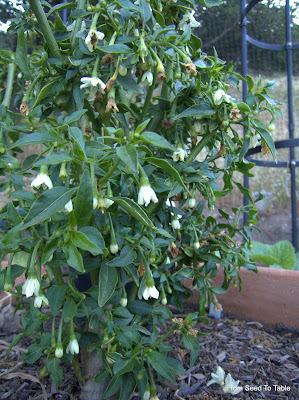 Pot grown capers need regular watering and food to look good and produce flowers. When the weather is hot I water the plants almost every day and feed them once a week with a water soluble fertilizer through the summer and early fall. 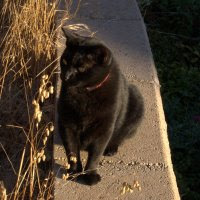 I stop feeding them around October to allow them to harden off and go dormant for the winter. In the same area there is a volunteer coming up through a crack in the wall! It's time to start spraying the ivy with Liquid Fence. The stuff really works and since we don't get summer rains to wash it off, I only have to reapply if the plants put out significant new growth. 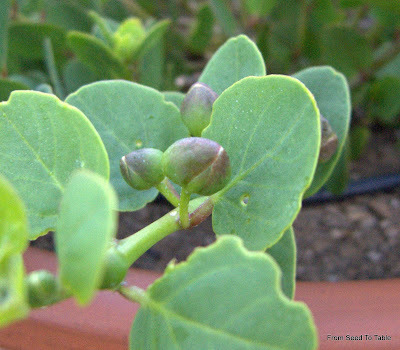 Now here's the ultimate goal... Caper buds ready to be picked and preserved in salt. 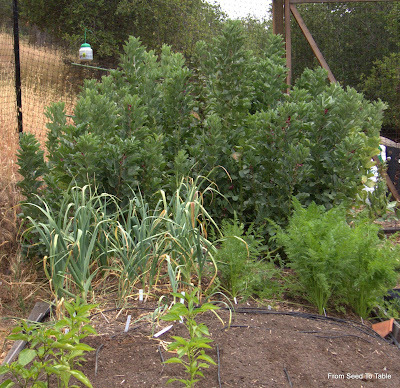 In this corner... Crimson Favas, carrots, and garlic that I've been harvesting immature (green garlic). 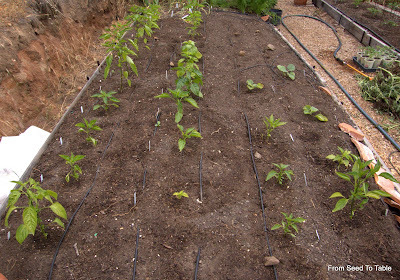 And shown below, the other end of the bed is now home to newly planted peppers and the patch of Superaguadulce Morocco strain favas. 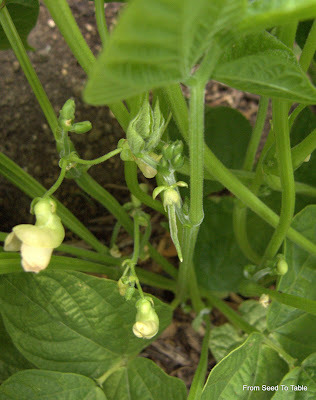 In the next photo you can see the snap and snow peas on the left. 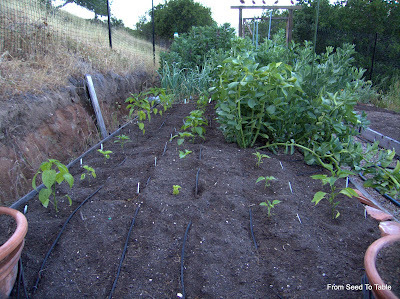 Moving to the right, the cilantro is sprouting at the foot of the pea vines, then there's a row of beets (Golden and Dewing's Early Blood Turnip), then Landreth Stringless and Royal Burgundy bush beans. 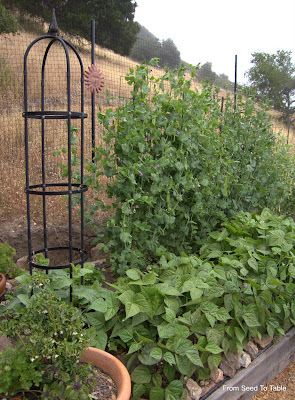 Serpent cucumbers are planted at the base of the black tower and to the left of them Italian parlsey is getting going. The yellow flowers futher back are the bolting Senposai. 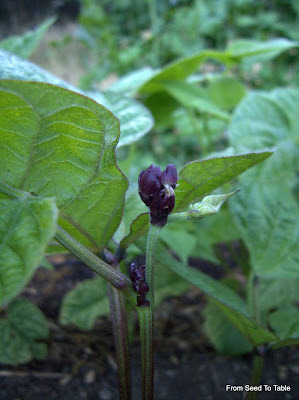 The Royal Burgundy plants are sporting lovely purple flower buds. At the corner of the bed is a large pot containing the Aleppo pepper that survived the winter and is now blooming and setting a new crop of chiles. 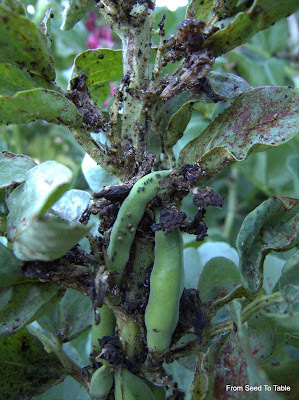 Look at this rather nasty looking shoot on one of the Crimson fava plants. Not long ago it was even nastier looking, nearly alive with black aphids. The lady beetles and other beneficial insects have been hard at work cleaning up the mess. I'm really amazed at how efficient the beneficials have been at controlling the aphids. The aphid population on the Superaguadulce favas is almost nothing now and their numbers are rapidly declining on the Crimson favas. In the first bed on the other side of the main path I've got a couple of Cocozelle zucchini plants, Gigante kohlrabi on the right, Golden Chard in front, and Cavolo Nero kale beyond the zucchini. 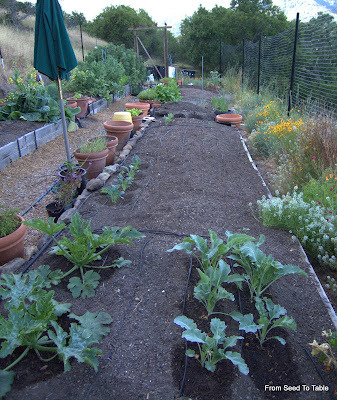 The rest of that bed is reserved and ready for the brassicas that I should be harvesting through the fall and winter. Some of them are started already and others will be seeded in June. And I am currently clearing out and preparing the far bed on the right to be planted with tomatoes that are growing in pots at the moment. This is the Aji Pineapple that survived the winter and with a bit more attention from me (it needs food and a trim) should be coming back nicely. The Bolting Bunch shown below... Chioggia beets, Golden Corn Salad and Tuscan Arugula. 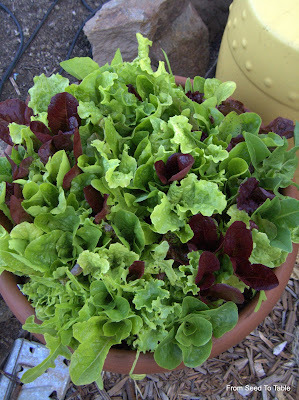 The Pinetree lettuce mix is happy in its pot. We've been enjoying green salads every few nights. I can hardly pick the lettuce fast enough. Here's part of my potato patch. 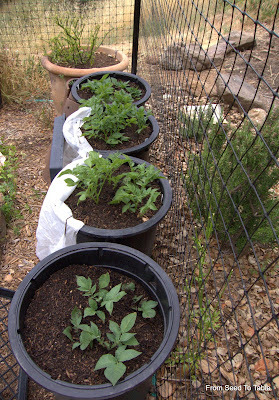 I've got seven different varieties of potatoes growing in 15-gallon black plastic pots. The pots tend to get too hot since they are facing full south and getting a bit too much sun. I've leaned roof tiles or draped white row cover on the south sides of the pots to shade them which seems to be helping a lot. The black nursery flats are placed on top to partially shade the interior until the pots are filled with soil. Three of the pots are nearly full of soil. The fourth pot and two others were planted later so they still have a way to go. I tried growing potatoes in pots last fall and learned too late that I needed to be quick about covering up the stems of the growing plants. 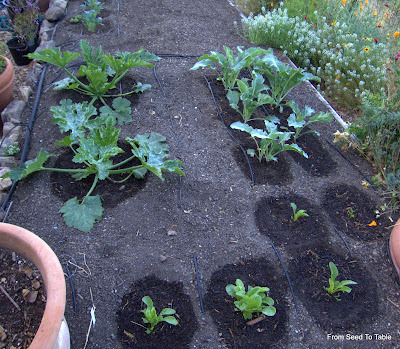 The stems will supposedly not root and set potatoes if they are exposed to too much light. 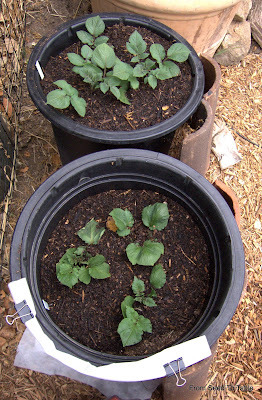 I was very slow to add soil to the pots in my previous attempt to grow potatoes in pots and indeed, when I harvested them there were potatoes only in the bottom of the pot. This time around I've been adding soil nearly every day so that there is only a little tuft of leaves showing. 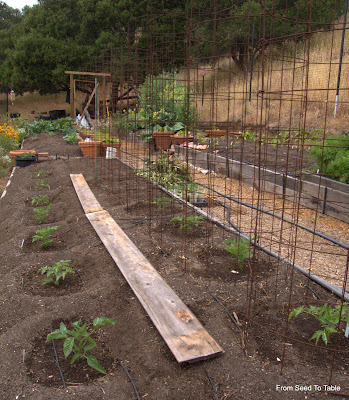 The pots shown above and below are in need of a bit more soil. 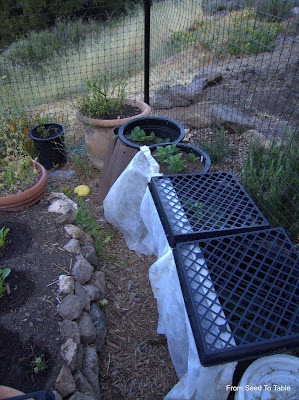 I've been using a mix of three parts basic bagged potting soil to 1 part sifted home made compost. The area outside the garden fence to the right of the stone lined path is my next project. I want to put edibles here but I can't put anything there that the deer would enjoy eating. This pretty much restricts the plant list to certain herbs and a few other plants. 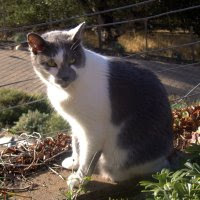 So far I've planted three different varieties of Rosemary - 'Tuscan Blue', 'Santa Barbara Blue', and 'Arp'. 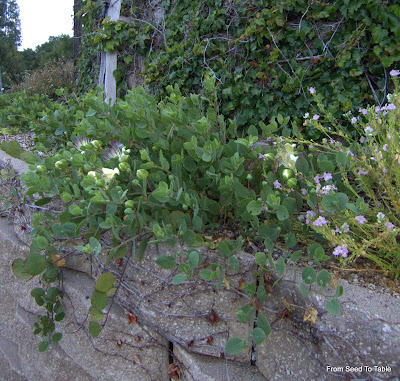 I would like to plant more of it on the slope outside the fence. There's a couple of pots of garden sage and a lemon verbena sitting out to see if the deer will nibble on them - no sense going to the trouble of planting something until I know if they are deer food or not. 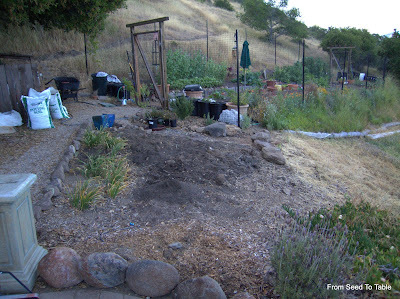 The deer came through that area the other night and ate all the flowers on the California poppies (dang them) but didn't touch the salvia or lemon verbena so I think those are safe to plant. I'm going to set a few pots of thyme out to see how they fare. The thyme should be nice as an edging for the path. A few other plants that I might try are true bay (in a pot since I don't want it to get too big), myrtle, oregano, winter savory, and lemon grass. The deer don't touch Society garlic so perhaps they would leave chives alone. The main crop that I envision for that area is capers. 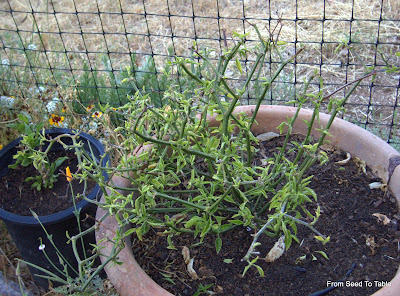 I've been growing Capparis spinosa var. 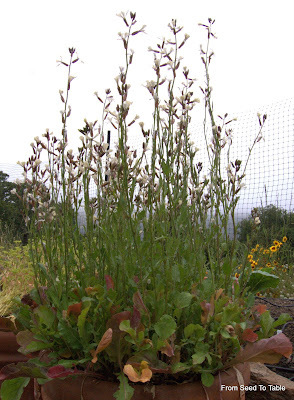 inermis from seed for a number of years and have quite a stockpile of plants. 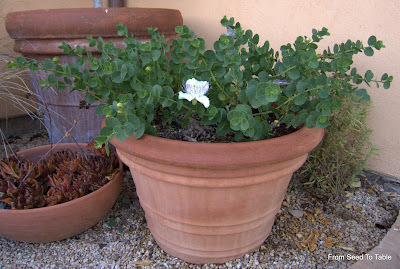 I've already got a number of plants happily growing in large pots that are my "mother" plants. Now I want to get a bunch of plants established in the ground so that I can start harvesting more buds. So, as soon as I finish my annual fling with the string trimmer and the soon to be tinder dry grasses drying on the surrounding hillside. And after the tomato plants are finally in the ground. Then, project Caper!